When an electric cord is molded to two connectors, it is known as an electrical cord set or power cord. Electrical Connectors – Quail Electronics, Inc. There are many different types of electrical connectors for many different types of appliances and purposes. Some are meant to connect two pieces of cable while others are meant to connect a cable to an electrical junction. Electric connectors have “male” and “female” connections. The male electrical connector fits into the female electrical connector. 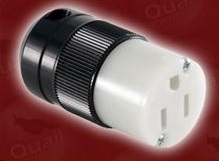 Male connectors are found at the end of power plugs, which fits into the slots of the socket, the female connector. Often times, electronic connectors are designed with a specific mechanical feature that prevents mating outside of a correctly-aligned appropriate connecter. The variants in electrical connectors are primarily categorized by their pinout, which refers to the electrical contacts, or pins, of the male connection and its specific number, configuration and relation to the female connection, into which the pins are inserted. Each contact of a particular connector must “mate” with the contact of a matching connector. The pinout of an electrical connector is essential in its construction and use. Additionally, the general physical construction, size, contact resistance, insulation between pins, strength, resistance to outside forces (vibration, pressure, water, etc. ), number of reconnections it can endure and the ease of connecting and disconnecting are further varying details that pertain to the categorization of electrical connectors. Electrical connectors are important utilities in consideration to industrial, commercial and consumer products. Because of the vast variety of electrical connectors, as well as the many different contexts in which they are relied on, it is important for manufacturers to make them easy to distinguish and assemble, along with inexpensive for consumers. Types of electrical connectors other than plug and socket connectors include, but are not limited to: component and device connectors, which can involve a plug and socket mechanism, but more commonly incorporates individual screw or cramped-on connectors; blade connectors, which uses a flat conductive blade coupled with, appropriately, a blade-shaped receptacle, both of which are connected to a wire; and terminal blocks, which serves as an easy approach towards connecting single electrical wires to one another within an item of equipment. Electrical Connectors Electrical connectors are at the ends of power cords and in wall sockets and are used to transmit electric power, usually AC, between a power source and a device that operates on electric power; a connection that may be temporary, in the case of various portable appliances, or serve as a permanent electrical link between two wires or machines, like with a television cable.